Acute kidney injury (AKI) is a common and serious problem affecting millions and causing death and disability for many. In 2012, Kidney Disease: Improving Global Outcomes completed the first ever, international, multidisciplinary, clinical practice guideline for AKI. The guideline is based on evidence review and appraisal, and covers AKI definition, risk assessment, evaluation, prevention, and treatment. In this review we summarize key aspects of the guideline including definition and staging of AKI, as well as evaluation and nondialytic management. Contrast-induced AKI and management of renal replacement therapy will be addressed in a separate review. Treatment recommendations are based on systematic reviews of relevant trials. Appraisal of the quality of the evidence and the strength of recommendations followed the Grading of Recommendations Assessment, Development and Evaluation approach. Limitations of the evidence are discussed and a detailed rationale for each recommendation is provided. Acute kidney injury (AKI) is common and imposes a heavy burden of illness (morbidity and mortality). Furthermore, the costs of care for patients with AKI are high and there is considerable variability in practice. AKI is amenable to prevention, early detection and treatment. Clinical practice guidelines in the field thus have the potential to reduce variations, improve outcomes, and reduce costs. Care of the critically ill patient with AKI requires co-ordination of care across multiple disciplines in a variety of settings. This year, Kidney Disease: Improving Global Outcomes (KDIGO), a nonprofit foundation, has published the first international, interdisciplinary clinical practice guideline on AKI , which is also available in its entirety on the KDIGO website . We present here a shortened version of the guideline focusing on definitions, risk assessment, evaluation, and nondialytic management; we also provide additional rationale and commentary for those recommendation statements that most directly impact the practice of critical care. A complete and detailed description of the methods can been found online . The KDIGO Co-Chairs appointed two Co-Chairs of the Work Group, who then assembled experts in several domains (nephrology, critical care medicine, internal medicine, pediatrics, cardiology, radiology, infectious diseases, and epidemiology). The Evidence Review Team at Tufts Medical Center, Boston, MA, USA consisted of physician-methodologists with expertise in nephrology and internal medicine, and research associates and assistants. The evidence selection, appraisal, and presentation have followed methodology previously described in KDIGO clinical practice guidelines . Work Group members reviewed all retrieved relevant articles, data extraction forms, summary tables, and evidence profiles for accuracy and completeness. The four major topic areas of interest for AKI included: definition and classification; prevention; pharmacologic treatment; and renal replacement therapy (RRT). Populations of interest were those at risk for AKI (including those after intravascular contrast-media exposure, aminoglycosides, and amphotericin), and those with AKI or at risk for AKI with a focus on patients with sepsis or trauma, receiving critical care, or undergoing cardiothoracic surgery. We excluded studies on AKI from rhabdomyolysis, specific infections, and poisoning or drug overdose. Overall, we screened 18,385 citations. We limited outcomes to those important for decision-making, including development of AKI, need for or dependence on RRT, and all-cause mortality. When weighting the evidence across different outcomes, we selected as the crucial outcome that which weighed most heavily in the assessment of the overall quality of evidence. Values and preferences articulated by the Work Group included: a desire to be inclusive in terms of meeting criteria for AKI; a progressive approach to risk and cost such that, as severity increased, the group put greater value on possible effectiveness of strategies, but maintained high value for avoidance of harm; and intent to guide practice but not limit future research. The grading approach followed in this guideline and the wording of each recommendation are adopted from the Grading of Recommendations Assessment, Development and Evaluation system [4, 5]. The strength of each recommendation is rated as level 1 (strong) or level 2 (weak or discretionary). In addition, each statement is assigned a grade for the quality of the supporting evidence: A (high), B (moderate), C (low), or D (very low). Furthermore, on topics that cannot be subjected to systematic evidence review, the Work Group issued statements that are not graded which hopefully will provide general guidance that is based on clinical experience. The Grading of Recommendations Assessment, Development and Evaluation system is best suited to evaluate evidence on comparative effectiveness. Some of our most important guideline topics involve diagnosis and staging of AKI, and here the Work Group chose to provide ungraded statements. These statements are indirectly supported by evidence on risk relationships and resulted from unanimous consensus of the Work Group and should not be viewed as weaker than graded recommendations. The Work Group developed 61 graded recommendation statements and 26 ungraded statements. The six major domains are: (A) definition and staging; (B) risk assessment; (C) evaluation and general management; (D) prevention and treatment; (E) contrast-induced AKI; and (F) RRT for AKI. Domains (A) through (D) are presented here while domains (E) and (F) are presented in Lameire et al. immediately following this review. AKI is defined by an abrupt decrease in kidney function that includes, but is not limited to, acute renal failure. AKI is a broad clinical syndrome encompassing various etiologies, including pre-renal azotemia, acute tubular necrosis, acute interstitial nephritis, acute glomerular and vasculitic renal diseases, and acute postrenal obstructive nephropathy. More than one of these conditions may coexist in the same patient and epidemiological evidence supports the notion that even mild, reversible AKI has important clinical consequences, including increased risk of death [6, 7]. AKI can thus be considered more like acute lung injury or acute coronary syndrome. Furthermore, because the manifestations and clinical consequences of AKI can be quite similar (even indistinguishable) regardless of whether the etiology is predominantly within the kidney or predominantly from outside stresses on the kidney, the syndrome of AKI encompasses both direct injury to the kidney as well as acute impairment of function. The Acute Dialysis Quality Initiative group developed the Risk, Injury, Failure; Loss and End-stage kidney disease (RIFLE) system for diagnosis and classification of a broad range of acute impairment of kidney function through a broad consensus of experts . Studies totaling over 0.5 million patients from around the world have shown that AKI defined by RIFLE is associated with decreased survival and that increasing RIFLE stage leads to increased risk of death [9–14]. More recently, the Acute Kidney Injury Network endorsed the RIFLE criteria with a modification to include small changes in serum creatinine (SCr) (≥0.3 mg/dl or 26.5 μmol/l) when they occur within a 48-hour period . Two recent studies examining large databases in the USA  and Europe  validated these modified criteria. Thakar and colleagues found that increased severity of AKI was associated with an increased risk of death independent of comorbidity . Patients with stage 1 AKI (≥0.3 mg/dl or 26.5 μmol/l increase in SCr but less than a twofold increase) had an odds ratio of 2.2; in patients with stage 2 AKI (corresponding to RIFLE-I) there was an odds ratio of 6.1; and in stage 3 AKI patients (RIFLE-F) the odds ratio was 8.6 for hospital mortality. An additional modification to the RIFLE criteria has been proposed for pediatric patients in order to better classify small children with acute-on-chronic disease . Unfortunately, the existing criteria - while useful and widely validated - are still limited. First, despite efforts to standardize the definition and classification of AKI, there is still inconsistency in application [10, 11]. A minority of studies have included urinary output criteria despite their apparent ability to identify additional cases [13, 17] and many studies have excluded patients whose initial SCr is already elevated. Preliminary data suggest that roughly one-third of AKI cases are community acquired  and many cases may be missed by limiting analysis to documented increases in SCr. Indeed, the majority of cases of AKI in the developing world are likely to be community acquired. Few studies can thus provide accurate incidence data. An additional problem relates to the limitations of SCr and urine output for detecting AKI. In the future, biomarkers of renal cell injury may identify additional patients with AKI and may identify the majority of patients at an earlier stage. These concerns notwithstanding, and in view of the available evidence, the Work Group accepted the existing criteria for the diagnosis and staging of AKI and proposed a single definition of AKI that should be useful for practice, research, and public health. urine volume <0.5 ml/kg/hour for 6 hours. There are many types of exposure that may cause AKI. However, the chances of developing AKI after exposure to the same insult depend on a number of susceptibility factors that vary widely from individual to individual. Our understanding of susceptibility factors is based on many observational studies that address different settings with regards to the type, severity, duration, and multiplicity of insults. While this heterogeneity provides insight into some susceptibility factors that are common across various populations, the generalizability of results from one particular setting to the next is uncertain. It is important to screen patients who have undergone an exposure (Table 2) and to continue monitoring high-risk patients until the risk has subsided. Exact intervals for checking SCr and for which individuals' urine output should be monitored remain matters of clinical judgment; however, as a general rule, high-risk in-patients should have SCr measured at least daily and more frequently after an exposure, and critically ill patients should undergo urine output monitoring. This will necessitate urinary bladder catheterization in many cases, and the risks of infection should also be considered in the monitoring plan. Many opportunities for prevention and earlier recognition of AKI at emergency admissions may be missed. For example, a recent clinical practice assessment of emergency admissions in the UK highlights missed opportunities for prevention and earlier recognition of AKI . AKI is one of a number of conditions that affect kidney structure and function. Because the manifestations and clinical consequences of AKI can be quite similar (even indistinguishable) regardless of whether the etiology is predominantly within the kidney or predominantly from outside stresses on the kidney, the syndrome of AKI encompasses both direct injury to the kidney as well as acute impairment of function. 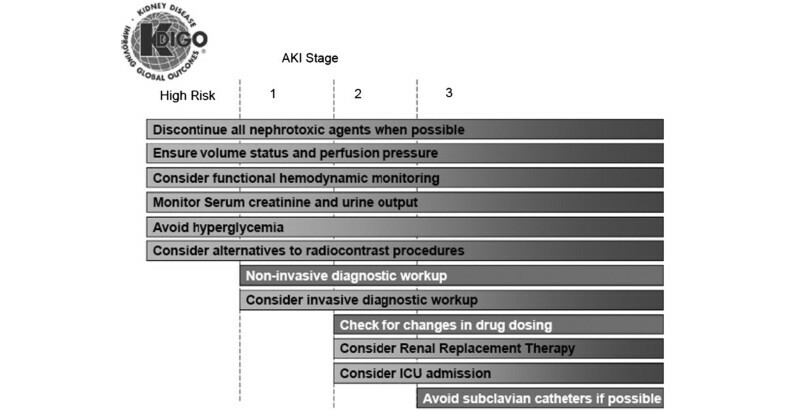 Since treatments of AKI are dependent to a large degree on the underlying etiology, this guideline focuses on specific diagnostic approaches (Figure 1). However, since general therapeutic and monitoring recommendations can be made regarding all forms of AKI, our approach will be to begin with general measures (Figure 2). Evaluation of acute kidney injury. AKI, acute kidney injury; GN, glomerulonephritis. Stage-based management of acute kidney injury. Shading of boxes indicates priority of action: solid shading, actions that are equally appropriate at all stages; graded shading, increasing priority as intensity increases. AKI, acute kidney injury. The clinical evaluation of AKI includes a careful history and thorough physical examination. Drug history should include over-the-counter formulations and herbal remedies or recreational drugs. The social history should include exposure to tropical diseases, and physical examination should include evaluation of fluid status, signs for acute and chronic heart failure, and infection. Measurement of cardiac function and intra-abdominal pressure should be considered in the appropriate clinical context. Laboratory parameters - including SCr, blood urea nitrogen, and electrolytes, complete blood count and differential - should be obtained. Urine analysis and microscopic examination as well as urinary chemistries may be helpful in determining the underlying cause of AKI. Imaging tests, especially ultrasound, are important components of the evaluation for patients with AKI. Finally, a number of biomarkers of functional change and cellular damage are under evaluation for early diagnosis of AKI, risk assessment for AKI, and prognosis of AKI. Although an evidence-based analysis of the role of biomarkers was beyond the scope of this guideline, recent work suggests in particular that the prognostic utility of newer urinary biomarkers - including neutrophil gelatinase-associated lipocalin, kidney injury molecule-1, and IL-18 - added to urine microscopic examination is significantly higher over clinical assessment alone . Because the stage of AKI has clearly been shown to correlate with short-term [6, 7, 11, 13] and even longer-term outcomes , it is advisable to tailor management to AKI stage. Figure 2 lists a set of actions that should be considered for patients with AKI. Note that for patients at increased risk, these actions begin even before AKI is diagnosed. Note also that management and diagnostic steps are both included in this figure. This is because response to therapy is an important part of the diagnostic approach. There are few specific tests to establish the etiology of AKI. However, a patient's response to treatment (for example, discontinuation of a possible nephrotoxic agent) provides important information as to the diagnosis. Despite the recognition of volume depletion as an important risk factor for AKI, there have been no randomized controlled trials (RCTs) that directly evaluated the role of fluids versus placebo in the prevention of AKI, except in the field of contrast-induced AKI (see Lameire et al. immediately following this review). While fluid resuscitation is widely believed to be protective, large multi-center studies have also shown that a positive fluid balance is associated with increased 60-day mortality [22–24]. Results of the Saline vs. Albumin Fluid Evaluation study - a RCT comparing 4% human albumin in 0.9% saline with isotonic saline in ICU patients - indicated that albumin is safe, albeit no more effective than isotonic saline for fluid resuscitation . The study demonstrated no difference in need for and duration of RRT . Very few patients in the trial received large volume fluid resuscitation (>5 l) and thus the results may not be applicable to all patients. Hydroxyethylstarch (HES) is a widely used, relatively inexpensive alternative to human albumin for correcting hypovolemia. A recent Cochrane review concluded that there is no evidence that resuscitation with colloids, instead of crystalloids, reduces the risk of death in patients with trauma, burns, or following surgery . In addition to some negative effects on coagulation, particularly with older forms of HES, development of renal dysfunction has been a concern associated with the use of mainly hypertonic HES. A recent meta-analysis described 11 randomized trials with a total of 1,220 patients: seven trials evaluating hyperoncotic albumin and four trials evaluating hyperoncotic starch . Hyperoncotic albumin decreased the odds of AKI by 76% while hyperoncotic starch increased those odds by 92% (odds ratio (OR) = 1.92; 95% confidence interval (CI) = 1.31 to 2.81; P = 0.0008). Parallel effects on mortality were observed. The renal effects of hyperoncotic colloid solutions appeared to be colloid specific, with albumin displaying renoprotection and hyperoncotic starch showing nephrotoxicity. A 7,000-patient study comparing 6% HES 130/0.4 in saline with saline alone was scheduled to begin in Australia and New Zealand in 2010. This study will provide further high-quality data to help guide clinical practice . The use of isotonic saline as the standard of care for intravascular volume expansion to prevent or treat AKI is thus based upon the lack of clear evidence that colloids are superior for this purpose, along with some evidence that specific colloids may cause AKI, in addition to their higher costs. It is acknowledged that colloids may be chosen in some patients to aid in reaching resuscitation goals, or to avoid excessive fluid administration in patients requiring large volume resuscitation, or in specific patient subsets (for example, a cirrhotic patient with spontaneous peritonitis, or in burns). Similarly, although hypotonic or hypertonic crystalloids may be used in specific clinical scenarios, the choice of crystalloid with altered tonicity is generally dictated by goals other than intravascular volume expansion (for example, hypernatremia or hyponatremia). In addition, isotonic saline solution contains 154 mmol/l chloride and when administration in large volumes will result in relative or absolute hyperchloremia (for a review, see Kaplan and Kellum ). Buffered salt solutions approximate physiological chloride concentrations and cause less acid-base disturbances and other side effects associated with hyperchloremia. Whether the use of buffered solutions results in better clinical outcomes, however, is uncertain. Once the intravascular volume has been optimized, it is not known which vasopressor agent is most effective for management of shock in general, or for the kidney specifically. A large RCT comparing dopamine with norepinephrine as the initial vasopressor in patients with shock showed no significant differences between groups with regard to renal function or mortality. However, there were more arrhythmic events among the patients treated with dopamine . Vasopressin is gaining popularity in the treatment of shock refractory to norepinephrine . Compared with norepinephrine, vasopressin increases blood pressure and enhances diuresis, but has not been proven to enhance survival or to reduce the need for RRT . Although there is some suggestion that vasopressin may reduce progression to renal failure and mortality in patients with septic shock , the Work Group concluded that current clinical data are insufficient to recommend one vasoactive agent over another in preventing AKI, but emphasized that vasoactive agents should not be withheld from patients with vasomotor shock over concern for kidney perfusion. Indeed, appropriate use of vasoactive agents can improve kidney perfusion in volume-resuscitated patients with vasomotor shock. While the risks and benefits of so-called early goal-directed therapy are unclear and three large trials are underway in the USA, Australia and the UK, there is some evidence that protocolized resuscitation may be better than standard care. A recent meta-analysis concluded that protocolized therapies (regardless of the protocol) with specific physiological goals can significantly reduce postoperative AKI . A problem in interpreting these studies is the lack of standardized hemodynamic and tissue oxygenation targets and management strategies used to verify the efficacy of these measures over standard perioperative care. A heterogeneous collection of study populations, types of surgical procedures, monitoring methods, and treatment strategies comprise this recent meta-analysis . The basic strategy of goal-directed therapy to prevent AKI in the perioperative period is based on protocols that avoid hypotension, optimize oxygen delivery, and include careful fluid management, vasopressors when indicated, and inotropic agents and blood products if needed . Given the limitations of the current studies and the lack of comparative effectiveness studies of individual protocols, we can only conclude that protocols for resuscitation in the setting of septic shock and high-risk surgery appear to be superior to no protocol. Pooled analyses of early multicenter studies have failed to confirm the early observations of beneficial effects of intensive insulin therapy on renal function; the risk of hypoglycemia with this approach is significant, and the survival benefits of intensive insulin therapy are in doubt [35, 36]. The international Normoglycemia in Intensive Care Evaluation and Survival Using Glucose Algorithm Regulation study found a 90-day mortality of 27.5% in the intensive insulin therapy group (target blood glucose range 81 to 108 mg/dl (4.5 to 6.0 mmol/l)) and a 90-day mortality of 24.9% in the conventional glucose control (target ≤180 mg/dl (≤10.0 mmol/l)) (OR for intensive control = 1.14; 95% CI = 1.02 to 1.28; P = 0.02) . The treatment effect did not differ significantly between surgical patients and medical patients. There was no significant difference between the two treatment groups in incidence of new RRT (15.4% vs. 14.5%). Severe hypoglycemia (blood glucose level ≤40 mg/dl (≤2.2 mmol/l)) was reported in 6.8% in the intensive-control group and in 0.5% in the conventional-control group (P <0.001). Considering the balance between potential benefits and harm, the Work Group suggests using insulin for preventing severe hyperglycemia in critically ill patients but in view of the danger of potentially serious hypoglycemia, we suggest that the average blood glucose should not exceed 149 mg/dl (8.3 mmol/l), but that insulin therapy should not be used to lower blood glucose to <110 mg/dl (6.1 mmol/l). The Work Group recognizes that these thresholds have never directly been examined in RCTs but are interpolated from the comparisons so far tested in the trials. Several expert panels have developed clinical practice guidelines for the nutritional management of patients with AKI, whether treated with or without RRT [38–42]. Observations in critically ill patients provide a rationale to maintain a total energy intake of at least 20 kcal/kg/day but not more than 25 to 30 kcal/kg/day, equivalent to 100 to 130% of the resting energy expenditure. Energy provision should be composed of 3 to 5 g (maximum 7 g) per kilogram body weight carbohydrates and 0.8 to 1.0 g per kilogram body weight fat. When continuous renal replacement therapy (CRRT) techniques are used it should be realized that they may result in additional losses of water-soluble, low-molecular-weight substances, including nutrients . Normalized protein catabolic rates of 1.4 to 1.8 g/kg/day have been reported in patients with AKI receiving CRRT [44–46] and about 0.2 g amino acids are lost per liter of filtrate, amounting to a total daily loss of 10 to 15 g amino acids. In addition, 5 to 10 g protein are lost per day, depending on the type of therapy and dialyzer membrane. Similar amounts of protein and amino acids are typically lost by peritoneal dialysis. Nutritional support should account for these losses by providing a maximum of 1.7 g amino acids/kg/day. Enteral feeding is associated with improved outcome/survival in ICU patients [47, 48] and should be recommended for patients with AKI. In a recent survey of the nutritional management of 195 children with AKI on CRRT, the maximal calorie prescription in the course of treatment averaged 53, 31, and 21 kcal/kg/day, and that for protein intake 2.4, 1.9, and 1.3 g/kg/day in children aged <1 year, 1 to 13 years, and >13 years, respectively . Although not validated by outcome studies, these figures provide an orientation for the macronutrient supply typically achieved in and tolerated by children with AKI receiving CRRT. On the basis of various mechanistic studies and support from preclinical data [51–54], loop diuretics (especially furosemide) have long been prescribed in the acute-care setting [55–57], and a number of RCTs have tested whether furosemide is beneficial for prevention or treatment of AKI. Specifically, prophylactic furosemide was found to be ineffective or harmful when used to prevent AKI after cardiac surgery [52, 53], and to increase the risk of AKI when given to prevent contrast-induced AKI . Epidemiologic data suggest that the use of loop diuretics may increase mortality in patients with critical illness and AKI , along with conflicting data that suggest no harm in AKI . Finally, furosemide therapy was also ineffective and possibly harmful when used to treat AKI [51, 60]. A systematic review and meta-analysis by Ho and Power also included six studies that used furosemide to treat AKI, with doses ranging from 600 to 3,400 mg/day . No significant reduction was found for in-hospital mortality or for RRT requirement. Furosemide may be useful in achieving fluid balance to facilitate mechanical ventilation according to the lung-protective ventilation strategy in hemodynamically stable patients with acute lung injury. However, a beneficial role for loop diuretics in facilitating discontinuation of RRT in AKI is not evident from clinical studies [62, 63]. The often retrospective and/or underpowered studies using prophylactic mannitol did not meet the criteria of the Work Group to be included in formulation of recommendations. Mannitol is often added to the priming fluid of the cardiopulmonary bypass system to reduce the incidence of renal dysfunction, but the results of these studies are not very convincing . Two small randomized trials - one in patients with pre-existing normal renal function , the second in patients with established renal dysfunction  - did not find differences for any measured variable of renal function. More convincing are the results obtained with the preventive administration of mannitol, just before clamp release, during renal transplantation [67, 68]. The sparse controlled data available have shown that 250 ml of 20% mannitol given immediately before vessel clamp removal reduces the incidence of post-transplant AKI, as indicated by a lower requirement of post-transplant dialysis. However, 3 months after transplantation, no difference is found in kidney function compared with patients who did not receive mannitol . Finally, it has been suggested that mannitol is beneficial in rhabdomyolysis by stimulating osmotic diuresis and by lowering the intracompartmental pressure in the affected crushed limbs [70–72]; again, these studies were either not randomized or were underpowered. A separate guideline on crush injury associated with disasters, mainly earthquake victims, has now been published by the International Society of Nephrology Renal Disaster Relief Task Force . Three systematic reviews have reached identical conclusions that dopamine does not provide any benefit for prevention or early treatment of AKI [74–76]. There is also limited evidence that the use of dopamine to prevent or treat AKI causes harm. Dopamine can trigger tachyarrhythmias and myocardial ischemia, decrease intestinal blood flow, cause hypopituitarism, and suppress T-cell function . Fenoldopam mesylate is a pure dopamine type-1 receptor agonist that has similar hemodynamic renal effects as low-dose dopamine, without systemic α-adrenergic or β-adrenergic stimulation . A meta-analysis found that fenoldopam reduces the need for RRT and in-hospital death in cardiovascular surgery patients . However, the pooled studies included both prophylactic and early therapeutic studies, as well as propensity-adjusted case-matched studies (rather than purely randomized trials). A 1,000-patient RCT of fenoldopam to prevent the need for RRT after cardiac surgery is currently underway (ClinicalTrials.gov: NCT00621790); meanwhile, this remains an unproven indication for fenoldopam therapy. Our analysis of existing data from suitable prophylactic studies of adequate size and study design that reported AKI incidence in patients randomized to fenoldopam versus placebo revealed a pooled relative risk (RR) of 0.96 (95% CI = 0.76 to 1.2; P = not significant). Only one study reported mortality (8-day) in sepsis patients randomized to fenoldopam (35%, n = 150) versus placebo (44%, n = 150), with a RR of 0.79 (95% CI = 0.59 to 1.05; P = 0.1) . As therapy for AKI, only one study reported (21-day) mortality in critically ill patients with early AKI randomized to fenoldopam (11/80, 13.8%) versus placebo (n = 19/75, 25.3%; P = 0.068) . Another study reported the change in renal function in AKI patients randomized to fenoldopam (n = 50) versus dopamine (n = 50), defined by the absolute SCr change between the beginning and end of the study drug infusion and the maximum decrease from study entry, which were significantly larger in the fenoldopam group: -0.53 ± 0.47 vs. dopamine: -0.34 ± 0.38 md/dl, P = 0.027 . Overall, therefore, no data from adequately powered multicenter trials with clinically significant end-points and adequate safety are available to recommend fenoldopam to either prevent or treat AKI. The guideline recommendation against using fenoldopam places a high value on avoiding potential hypotension and harm associated with the use of this vasodilator in high-risk perioperative and ICU patients, and a low value on potential benefit, which is currently only suggested by relatively low-quality single-center trials. Nigwekar and colleagues recently conducted a systematic review and meta-analysis of ANP for management of AKI . They found 19 relevant studies, among which 11 studies were for prevention and eight were for treatment of AKI. Pooled analysis of the eight treatment studies, involving 1,043 participants, did not show significant difference for either RRT requirement or mortality between the ANP and control groups. However, low-dose ANP preparations were associated with significant reduction in RRT requirement (OR = 0.34; 95% CI = 0.12 to 0.96; P = 0.04). The incidence of hypotension was not different between the ANP and control groups for low-dose studies, whereas it was significantly higher in the ANP group in the high-dose ANP studies (OR = 4.13; 95% CI = 1.38 to 12.41; P < 0.01). Finally, a pooled analysis of studies that examined oliguric AKI did not show any significant benefit from ANP for RRT requirement or mortality. Only two of the treatment studies included in Nigwekar and colleagues' analysis [84, 85] were of adequate size and quality to meet the criteria for our systematic review, which found no significant inconsistencies in the findings of both trials that (combined) included 720 subjects (351 treated with ANP). Therefore, although subset analyses separating low-dose from high-dose ANP trials suggest potential benefits, the preponderance of the literature suggests no benefit of ANP therapy for AKI. The Work Group therefore suggests this agent not to be used to prevent or treat AKI. Nesiritide (b-type natriuretic peptide) is the latest natriuretic peptide introduced for clinical use, and is approved by the US Food and Drug Administration only for the therapy of acute, decompensated congestive heart failure. Meta-analysis of outcome data from these and some other nesiritide congestive heart failure trials has generated some controversy [86–88]. Sackner-Bernstein and colleagues analyzed mortality data from 12 randomized trials; three trials provided 30-day mortality data, and found a trend towards an increased risk of death in nesiritide-treated subjects . In another meta-analysis of five randomized trials that included 1,269 subjects , the same investigators found that there was a relationship between nesiritide use and worsening renal function, defined as SCr increase >0.5 mg/dl (>44.2 μmol/l). Nesiritide doses ≤0.03 μg/kg/minute and even at doses ≤0.015 μg/kg/minute significantly increased the risk of renal dysfunction compared with non-inotrope-based controls or compared with all control groups (including inotropes). There was no difference in dialysis rates between the groups. Another retrospective study determined independent risk factors for 60-day mortality by multivariate analysis in a cohort of 682 older heart-failure patients treated with nesiritide versus those who were not . When patients were stratified according to nesiritide usage, AKI emerged as an independent risk factor for mortality only among patients who received the drug. Strikingly, among these heart-failure patients who developed AKI, nesiritide usage emerged as the only independent predictor of mortality. A 7,000-patient multicenter RCT in acute decompensated heart failure has recently assessed the clinical effectiveness of nesiritide therapy for acute decompensated heart failure (the Acute Study of Clinical Effectiveness of Nesiritide in Decompensated Heart Failure; Clinicaltrials.gov: NCT00475852). A prospective, randomized clinical trial (the Nesiritide Study) found no benefit of nesiritide for 21-day dialysis and/or death in patients undergoing high-risk cardiovascular surgery . However, this study did demonstrate that the prophylactic use of nesiritide was associated with reduced incidence of AKI in the immediate postoperative period (nesiritide 6.6% vs. placebo 28.5%; P = 0.004). Recently, Lingegowda and colleagues investigated whether the observed renal benefits of nesiritide had any long-term impact on cumulative patient survival and renal outcomes . Data on all 94 patients from the Nesiritide Study were obtained with a mean follow-up period of 20.8 ± 10.4 months. No differences in cumulative survival between the groups were noted, but patients with in-hospital incidence of AKI had a higher rate of mortality than those with no AKI (41.4% vs. 10.7%; P = 0.002). The possible renoprotection provided by nesiritide in the immediate postoperative period was not associated with improved long-term survival in patients undergoing high-risk cardiovascular surgery. Although evidence from a variety of small studies suggests the potential for therapy with natriuretic peptides to be useful for the prevention or treatment of AKI in a variety of settings, there are no definitive trials to support the use of atrial natriuretic peptide (ANP), b-type natriuretic peptide, or nesiritide for these purposes. The Work Group therefore suggests these agents should not be used for prevention or treatment of AKI. AKI occurs in 60% of neonates suffering from perinatal asphyxia , and experimental studies have indicated an important role for adenosine-mediated vasoconstriction in neonatal kidneys exposed to normocapnic hypoxemia . A potential renoprotective effect of theophylline in perinatal asphyxia has been assessed in three randomized, placebo-controlled clinical trials [94–96], including a total of 171 term neonates. Theophylline was uniformly administered in the first hour of life as a single intravenous bolus at a dose of 5 mg/kg [94, 96] or 8 mg/kg . All three studies observed significantly higher glomerular filtration rate, higher urine output with more negative fluid balance, and lower urinary β2- microglobulin excretion with theophylline as compared with placebo during the first 3 to 5 days of life. In each study, theophylline treatment was associated with a significantly reduced risk of severe renal dysfunction (17 to 25% vs. 55 to 60% in the placebo group; RR = 0.3 to 0.41). The beneficial effect was selective for kidney function, whereas the incidence of extra-renal complications was unaltered. Patient survival was not affected by treatment. In line with these studies in mature neonates, a similar improvement of glomerular filtration rate and urine output was observed during the first 2 days of life by administration of 1 mg/kg theophylline versus placebo in 50 very preterm neonates with respiratory distress syndrome . Follow-up of renal function throughout the first year of life by Bhat and colleagues found equally normal glomerular and tubular function in both groups from 6 weeks of age onward . Hence, while theophylline clearly improves renal function in the first week of life in postasphyctic neonates, the overall benefit from this intervention in neonatal intensive care is less evident in view of the complete long-term recovery of renal function in the placebo-treated controls and the absence of an effect on patient survival. By contrast, adenosine antagonism does not appear beneficial in cardiorenal syndrome. Three pivotal phase III trials in a total of 2,500 patients were recently completed, aiming to corroborate the renoprotective effects of rolofylline in patients with cardiorenal syndrome, and to establish drug safety. The final results of the PROTECT trial have recently been published . Rolofylline, as compared with placebo, did not provide a benefit with respect to the three primary end-points: survival, heart-failure status, and changes in renal function. Persistent renal impairment developed in 15.0% of patients in the rolofylline group and in 13.7% of patients in the placebo group (P = 0.44). By 60 days, death or readmission for cardiovascular or renal causes had occurred in similar proportions of both groups of patients. Adverse-event rates were similar overall; however, only patients in the rolofylline group had seizures, a known potential adverse effect of A1-receptor antagonists. Rolofylline therefore does not appear to be effective for treatment of cardiorenal AKI. Based on an analysis of the three RCTs with insulin-like growth factor-1 that are currently available [99–101] and which were overall negative or at least equivocal, the Work Group recommends against its use in patients with AKI. Aminoglycosides exhibit a number of favorable pharmacokinetic and pharmacodynamic advantages, but a major dose-limiting toxicity of the aminoglycosides remains the risk of drug-induced AKI . The risk of AKI attributable to aminoglycosides is sufficiently high (up to 25% in some series, depending upon the definition of AKI used and the population studied) [103–109] that they should no longer be used for standard empirical or directed treatment, unless no other suitable alternatives exist. When still required, the potential efficacy of single-dose daily regimens (or other extended dosing treatment programs) of aminoglycosides versus multiple-daily dosing strategies has been extensively studied in numerous controlled and uncontrolled clinical studies over many years [110–121], and the subject has been the focus of a number of formal meta-analyses [122–127]. The cumulative results of this evidence-based review and numerous meta-analyses indicate that once-daily dosing strategies generally result in less AKI when compared with multiple-dose dosing strategies, although the benefit accrued by the single-daily dose strategy is modest and inconsistent across a number of these studies. In view of the high variability of the pharmacokinetic characteristics of aminoglycosides, therapeutic drug monitoring in combination with or independent from single-dose daily treatment regimens is recommended. In single-dose or extended-dose treatment strategies, the peak drug level should be at least 10-fold greater than the minimum inhibitory concentration of the infecting microorganism. The trough level should be undetectable by 18 to 24 hours to limit accumulation of aminoglycosides in renal tubular cells and to minimize the risk of AKI. Aminoglycoside aerosol delivery systems are now in use to provide high intrapulmonary antibiotic levels with minimal systemic and kidney concentrations of the antibiotic. However, significant nephrotoxicity with the use of inhaled tobramycin has been described in at least two cases [128, 129]. The safety and efficacy of lipid formulations of amphotericin B have been studied in numerous experimental and clinical trials with conventional amphotericin B as the comparator [130–142]. A detailed analysis of these various trials, and a number of meta-analyses that have analyzed this clinical question, concluded that the lipid formulations are less nephrotoxic than amphotericin B deoxycholate [133, 135]. When feasible, we recommend that lipid formulations supplant the use of conventional amphotericin B to reduce the risk of nephrotoxicity. Alternatively, when feasible, it may be best to avoid polyene antifungal agents entirely and use alternative agents, such as the azoles and echinocandins [143–147]. A comprehensive meta-analysis examining off-pump versus conventional coronary artery bypass surgery found that the off-pump technique was associated with a statistically significant 40% lower odds of postoperative AKI and a non-significant 33% lower odds for dialysis requirement . Within the selected trials, off-pump coronary artery bypass graft surgery was not associated with a significant decrease in mortality. It is apparent from this meta-analysis that the trials were clinically heterogeneous, particularly with regard to their definitions of kidney outcomes, and mostly were of poor to fair quality (based on the Jadad score). The very low event rates (often zero or one patient) make the estimates suspect and highly imprecise. There is also a question of publication bias. There are several large trials in progress that are likely to generate more definitive data. The Work Group concluded that there was not enough evidence at present to recommend off-pump coronary artery bypass for reducing AKI or the need for RRT. A meta-analysis did not find evidence that N-acetylcysteine used perioperatively could alter mortality or renal outcomes after major cardiovascular or abdominal cancer surgery when radiocontrast agents are not used . Only a single study has compared N-acetylcysteine with placebo in critically ill patients with hypotension and was also negative . JAK is Professor of Critical Care Medicine, Medicine, Bioengineering and Clinical and Translational Science, and Vice Chair for Research within the Department of Critical Care Medicine at the University of Pittsburgh. He is also the Director of the Program on Bioengineering and Organ Support for the Clinical Research Investigation and Systems Modeling of Acute Illness Center at the University of Pittsburgh. NL is Emeritus Professor of Medicine and former Chief of the Renal Division at the University Hospital of Ghent. A special debt of gratitude is owed to the KDIGO Co-Chairs Kai-Uwe Eckardt and Bertram Kasiske and the KDIGO Board for their invaluable guidance throughout the development of this guideline. In particular, the authors thank the Evidence Review Team members - Katrin Uhlig, Jose Calvo-Broce, Aneet Deo, and Amy Earley - for their substantial contribution to the rigorous assessment of the available evidence. They are also especially grateful to the Work Group members for their expertise throughout the entire process of literature review, data extraction, meeting participation, the critical writing and editing of the statements and rationale, which made the publication of this guideline possible. The generous gift of their time and dedication is greatly appreciated. Finally, and on behalf of the Work Group, the authors gratefully acknowledge the careful assessment of the draft guideline by external reviewers. The Work Group considered all of the valuable comments made, and where appropriate, suggested changes were incorporated into the final publication. JAK has served as an Advisor/Consultant for Abbott, Alere, Astute Medical, Baxter, CytoSorbents, EBI, Eli Lilly, Fresenius, Gambro, Siemens and Spectral Diagnostics, and as a Speaker for Baxter, Fresenius, and Gambro. He has also received grant/research support from Astute Medical, Baxter, CytoSorbents and Gambro. NL declares that he has no competing interests.